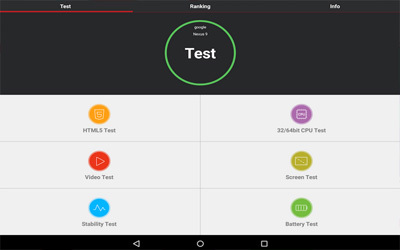 This is old version AnTuTu Benchmark 6.1.4 apk for Android, you can install it if you want to downgrade or install old app. It is top Tools apps from AnTuTu. In the second phase, this app verifies how your smartphone handle 2D graphic. It test your phone or tablet through several pixelated images to check how the device response to the images. The final phase is quite similar with the second phase. The only thing difference is instead checking 2D graphic, it test 3D graphic. You will see 3D graphic sequence while testing is running. Moreover, Antutu also has a feature called AntuTu Officer. The purpose of this feature is to check the originality of your smartphone. In order to check the overall originality of your android device, you have to make sure the battery is fully charged. Close all running apps when the process is initiated. Do not use the device for texting or playing games while this app is processing. All you need to do is waiting and be patient. This checking will takes a while. New designed 3D Testing Scene. Review and comments for your device. Fixed abnormal high score in random I/O test.